Second Life photographers experimenting with the Droste effect is not something I have come across before so it was intriguing to see what was possible and how this technique could be applied to an image taken in SL. Needless to say the Second Life image could be replaced with a real photo although this may involve a little more preparation for the photo used. For this tutorial I use Gimp but it is also possible to create Droste images with Photoshop. If you prefer to use Photoshop you will need the Pixel Blender Plugin. 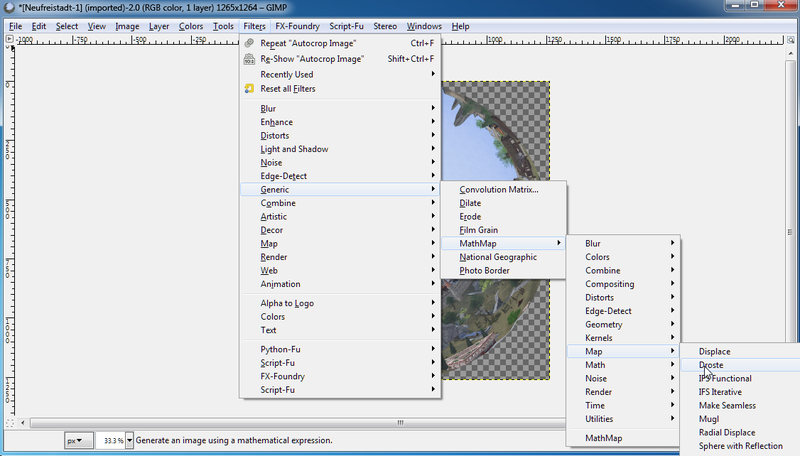 For Gimp users you will need the Math Map Plugin. If you are new to Droste images then a little explanation may be useful. 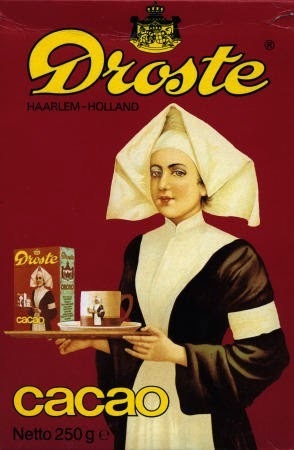 The name Droste is taken from a Dutch Cocoa company whose packaging showed an image of a nun carrying a tray with another cocoa carton showing the nun carrying the same tray. That tray also has a carton showing the nun carrying the tray, and so on. In short, the Droste effect is an image appearing within itself again and again. Download the plugin using the link above. During the instal process, change the directory from "C:\Users\your name\.gimp-2.6" to "C:\Users\your name\.gimp-2.8". 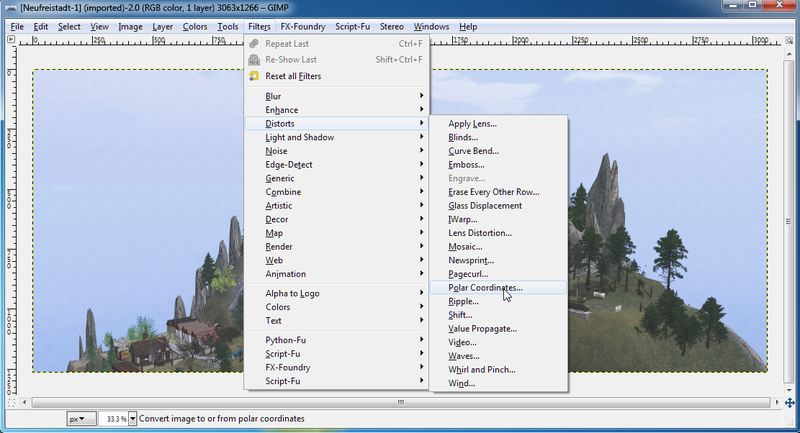 Start up Gimp and you should find the plugin under Filters > Generic > MathMap. If after doing this MathMap still hasn't installed correctly then you can manually move the MathMap plugin files from the 2.6 plugin folder to the 2.8 plugin folder. Then move the mathmap folder to the 2.8 folder. Now that the MathMap plugin is installed (hopefully without too much trouble) we can start creating a Droste image. The first thing you'll need is a good Second Life image. I took this picture at Neufreistadt - a very picturesque location and a good place for Second Life photographers to visit. When you take your snapshot it is a good idea to make it as large as possible because the process of creating the Droste effect tends to produce a smaller finished image. 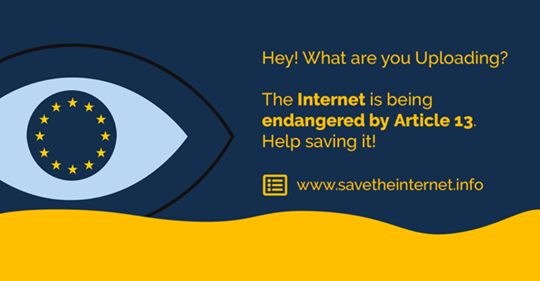 The size of this picture was around 3060 X 1266 px. A wide image as above is also recommended. 1/ Open your image in Gimp and do any editing you want such as cropping etc. 2/ Right click on the image in the layers panel and select 'Add Alpha Channel' from the drop down menu.This is so we can autocrop the image later. 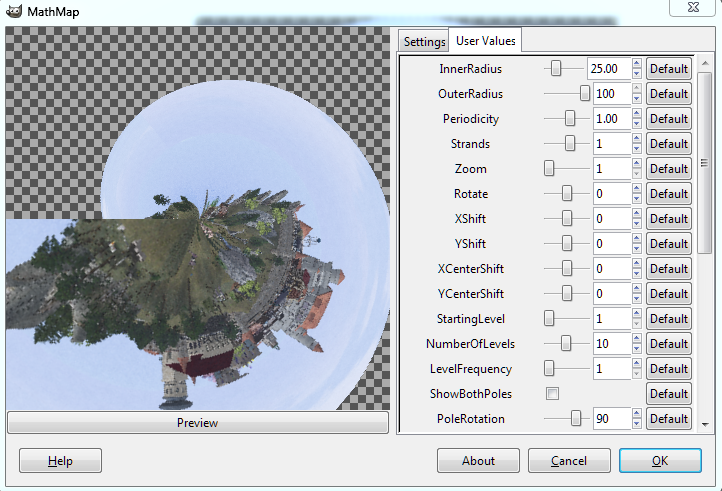 3/ Select Filters > Distorts > Polar Coordinates. This will open another small window as below. Make sure your settings are the same as in the image with 'Map from top' unchecked. 4/ You should see something similar to the above image in the Polar Coordinates window. Click 'OK' and then select Image > Autocrop Image. 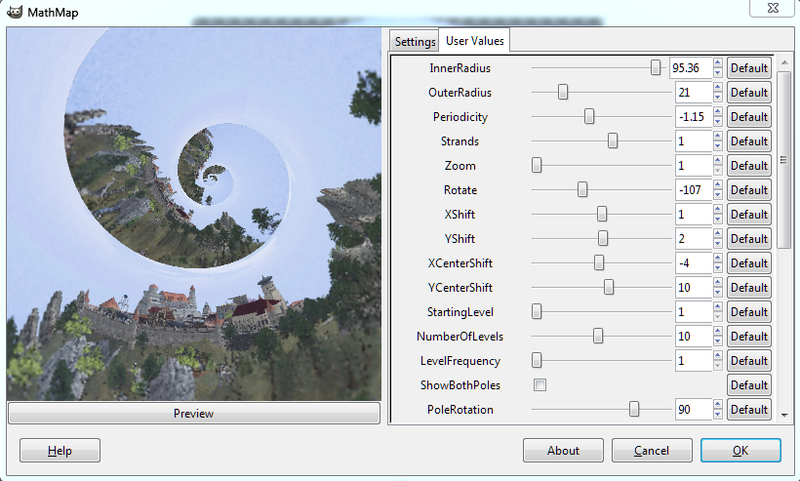 5/ Now Select Filters > Generic > MathMap > Map > Droste (see above). 6/ You should now see a window similar to the image above. Under the User Values tab there are plenty of options to play with, but the principle sliders to create your Droste effect are the Inner Radius and Outer Radius sliders. The Periodicity slider is also useful as well as 'TilePoles' and 'DoNot FlattenTransparency'. 7/ The best way to create an image that appeals to you is to experiment. The image above shows the settings I used in this example, although as you'll discover the settings will be different for each image. Once you are happy with your image click 'OK'. The example Droste settings shown above result in this image which I then cropped a little and overlayed a few grunge textures just to add more character. This picture reminded of a Medieval manuscript image so one of the textures I added gave it the appearance of old creased paper. The final result of all this is the image at the top of the page. 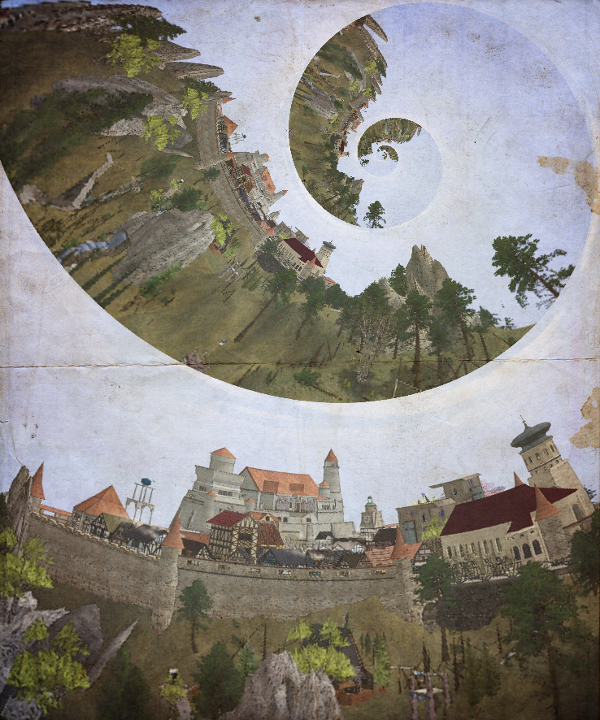 There are a number of variables when creating Droste images and I have shown just one way of producing them. It may be that the image you used didn't suit this particular way of creating a Droste effect, and if this is the case you could try ticking the 'Map From Top' box when opening the Polar Coordinates window. You could also try cutting a transparent hole in a section of your image to see what effect that has as well as playing with the 'StartingLevel', 'LevelFrequency' and the 'Strands' sliders in the Droste window. 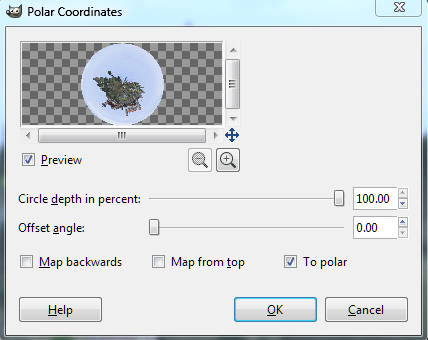 Another variable is to skip the polar coordinates step and just use the MathMap plugin - this works best when you create a transparent hole in part of the picture. If you would like to see more of my Droste images you are very welcome to visit my gallery spaces at Timamoon Arts and the Avalon Art Centre, or you can view them on my Marketplace store, (if this link doesn't take you straight to the Droste images on the Marketplace, close the window and click on it again. There is a bug in the wires somewhere). I hope you enjoy creating your own Droste images and hopefully sharing them in Second Life.